Iranian authorities have confirmed to UN investigators that imprisoned artist/activist Atena Farghadani was forcibly subjected to “virginity and pregnancy tests.” The admissions are reported in the just-published UN Human Rights Council report on Iran. 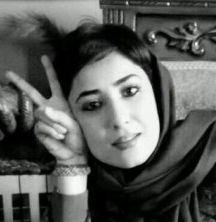 “On 10 January 2015, Atena Farghdani, a peaceful activist and artist, was arrested and beaten in front of her parents and later in front of a court judge. In June 2015, she received a sentence of 12 years and six months of imprisonment. While in prison, she was reportedly subject to torture, sexual harassment and degrading detention conditions. Furthermore, she was reportedly forced to take virginity and pregnancy tests, and held in prolonged solitary confinement for 20 days. Atena Farghadani contradicts the official Iranian account that the enforced procedures were in response to Internet reports of sexual assault. In a letter smuggled from her cell, Ms. Farghadani says she was subjected to the enforced virginity testing after being charged with “improper sexual contact” for shaking hands with her lawyer during a monitored prison visit in June, 2015. CRNI’s founder and chief executive Robert Russell has called for Atena Farghadani’s immediate release in an open letter to Iran’s President Hassan Rouhani.